Meteors, also known as "shooting stars," are fragments of extraterrestrial material or, more often, small particles of dust left behind by a comet's tail. We encounter meteors every time Earth crosses the path of a comet or the debris left behind a comet. Meteors vaporize and fizzle in the atmosphere and never reach Earth's surface. At certain times of the year, large swarms of meteors, all coming from roughly the same direction, can be seen. These are called meteor showers. Meteorites are larger chunks of rock, metal, or both that break off an asteroid or a comet and come crashing through Earth's atmosphere to strike the surface of Earth. They vary in size from a pebble to a three-ton chunk. Until the end of the eighteenth century, people believed that meteors and meteorites were atmospheric occurrences, like rain. Other theories held that they were debris spewed into the air by exploding volcanoes, or supernatural phenomena, like signs from angry gods. The first breakthrough in determining the true origins of meteors and meteorites came in 1714 when English astronomer Edmond Halley (1656–1742) carefully reviewed reports of their sightings. After calculating the height and speed of the objects, he concluded they must have come from space. However, he found that other scientists were hesitant to believe this notion. For nearly the next century, they continued to believe that the phenomena were Earth-based. The conclusive evidence to confirm Halley's theory came in 1803 when a fireball, accompanied by loud explosions, rained down two to three thousand stones on northwestern France. French Academy of Science member Jean-Baptiste Biot collected some of the fallen stones as well as reports from witnesses. After measuring the area covered by the debris and analyzing the stones' composition, Biot proved they could not have originated in Earth's atmosphere. Later observers concluded that meteors move at speeds of several miles per second. They approach Earth from space and the "flash" of a meteor is a result of its burning up upon entering Earth's atmosphere. In November 1833, astronomers had a chance to further their understanding of meteors when a shower of thousands of shooting stars occurred. Astronomers concluded that Earth was running into the objects as they were in parallel motion, like a train moving into falling rain. A look back into astronomic records revealed that a meteor shower occurred every year in November. It looked as though Earth, as it orbited the Sun, crossed the path of a cloud of meteors every November 17th. Another shower also occurred every August. Italian scientist Giovanni Schiaparelli (1835–1910) used this information to fit the final pieces into the puzzle. He calculated the velocity and path of the August meteors, named the Perseid meteors because they appear to radiate from a point within the constellation Perseus. He found they circled the Sun in orbits similar to those of comets. He found the same to be true of the November meteors (named the Leonid meteors because they seem to originate from within the constellation Leo). Schiaparelli concluded that the paths of comets and meteor swarms were identical. Most annual meteor showers can now be traced to the orbit of a comet that intersects Earth's orbit. Astroblemes are large, circular craters left on Earth's surface by the impact of large objects from outer space. Such objects are usually meteorites, but some may have been comet heads or asteroids. Few of these impacts are obvious today because Earth tends to erode meteorite craters over short periods of geologic time. The term astrobleme comes from two Greek roots meaning "star wound." 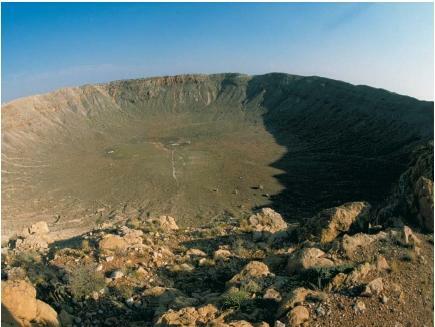 One of the most studied astroblemes is Barringer Crater, a meteor crater in northern Arizona that measures 0.7 miles (1.2 kilometers) across and 590 feet (180 meters) deep. It is believed to have been produced about 25,000 years ago by a nickel-iron meteorite about the size of a large house traveling at 9 miles (15 kilometers) per second. About 100 astroblemes have been identified around the world. A number are many times larger than the Barringer Crater and are hundreds of millions of years old. The largest astrobleme is South Africa's Vredefort Ring, whose diameter spans 185 miles (298 kilometers). The Leonid showers, occurring every year in November, are caused by the tail of comet Tempel-Tuttle, which passes through the inner solar system every 32-33 years. Such a year was 1998. On November 17 and 18 of that year, observers on Earth saw as many as 200 meteors an hour. The shower was so intense that scientists and others were worried that global telecommunications might be disrupted and space telescopes damaged or destroyed. However, careful preparation by satellite and telescope engineers prevented any major disruption or damage. Through radioactive dating techniques, scientists have determined that meteorites are about 4.5 billion years old—roughly the same age as the solar system. Some are composed of iron and nickel, two elements found in Earth's core. This piece of evidence suggests that they may be fragments left over from the formation of the solar system. Further studies have shown that the composition of meteorites matches that of asteroids, leading astronomers to believe that they may originate in the asteroid belt between Mars and Jupiter.